Positioning. As a second baseman I feel it is important to be about 15 feet behind the second base bag and maybe 5 – 10 feet to the left of the bag. As the pitcher is coming set start walking straight toward the pitcher. (Being deep makes it difficult for the runner to see you, it makes the runner a little wary because he doesn’t have a good feel of where you actually are). Decisions. As you get closer to the base make your decision to either shuffle a couple steps away from the bag and get ready to field a ball or break to the bag. Usually I like to pick out a spot on the field, if the runner gets to that spot I like to attempt a pick off, if he is short of that mark I like to shuffle back and get ready to field a ball. As you shuffle into fielding position don’t feel you have to get all the way into a normal second base position. Go Time. Get a couple shuffles and be ready by the time the ball crosses the hitting zone. For more detailed information on holding the runner, check out this article. You have to give up a little range to keep the runner close. Good luck on your transition to the infield, hope this helps and good luck. 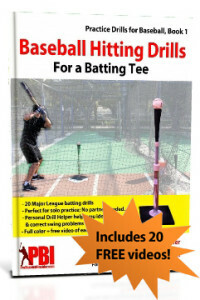 PBI has 100’s of pages of FREE baseball tips and instruction from the pros! What would be the best way to throw and catch a ball good? The best way to improve your catching and throwing is to just practice. Throw with a partner or even throw against a wall. Practicing is the best way to get better.